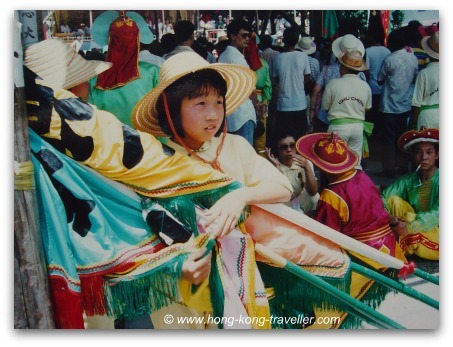 The Cheung Chau Bun Festival is one of the liveliest and certainly one-of-a-kind of Hong Kong Festivals, full of folklore and tradition and set in picturesque Cheung Chau Island, just a short ferry ride from the city. 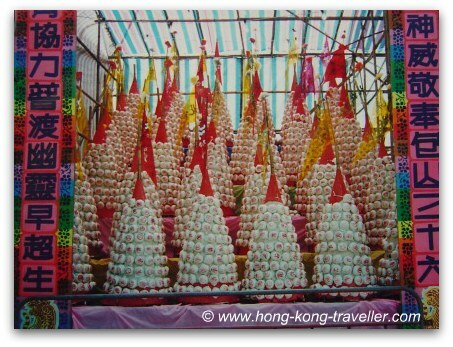 The trademark of the festival are the huge bamboo mountains covered with handmade buns which are set up near the Pak Tai Temple where the majority of the celebrations take place. 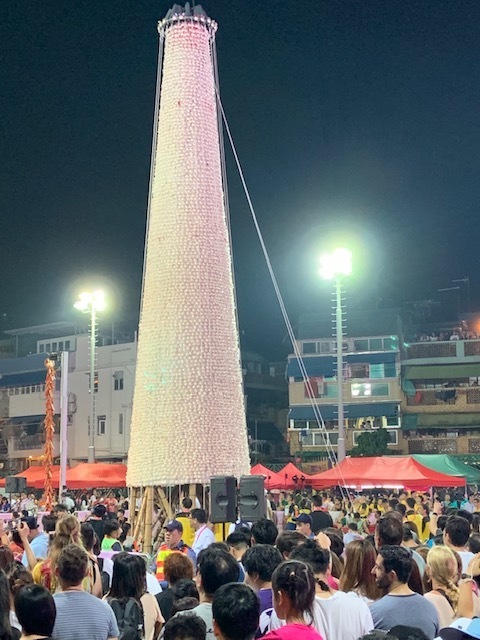 According to the legends, (one of them anyway) the festival originated after the island was plagued by an epidemic that killed thousands, and the disease was only conquered until the locals brought in the god Pak Tai to Cheung Chau who drove the plague and evil spirits away. Since then, this festival that is dedicated to Pak Tai has been celebrated every year, on the Buddha's Birthday, and the week-long festivities encompass a wide range of activities from the prayers and offerings to the god, to floats, parades, lion dances, and the culmination of the festival with a "bun scrambling" contest at midnight of the last day. 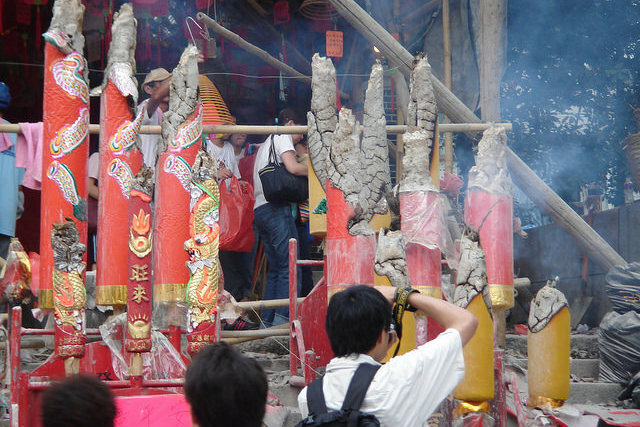 The Pak Tai Temple is the oldest in Cheung Chau and the religious centre of the island. This is the heart of the festival where most displays and activities will take place. 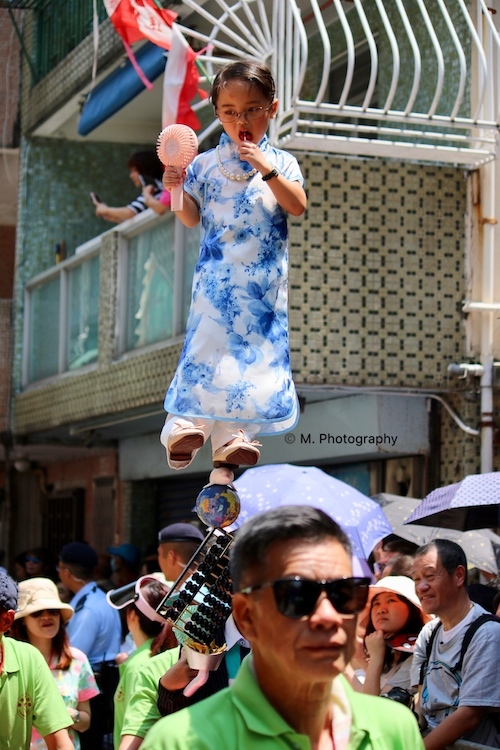 The Cheung Chau Bun Festival is a fantastic and very lively festival, and one YOU SHOULD NOT MISS if you happen to be in Hong Kong at the time. 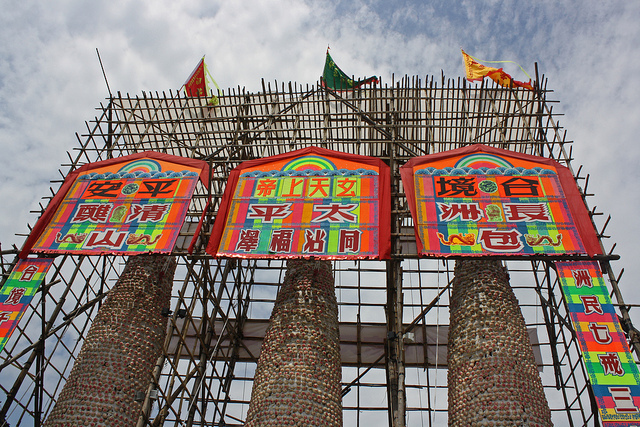 You will see the colorful stands with all kinds of celebratory and worship items, the many offerings from incense to fruits and of course buns to the god. Altars are set up and locals will come and pay their respects and pray for ongoing prosperity and health. 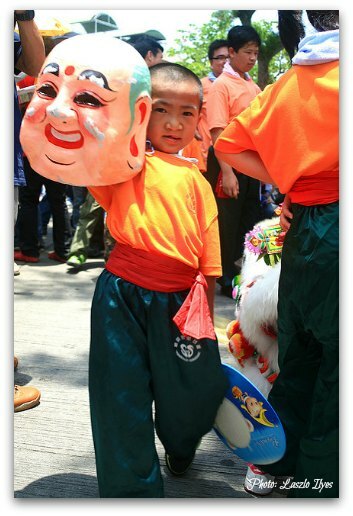 There is also a very colorful parade and you will see the typical lion dances, floats, marching bands, martial arts demonstrations and lots of drums and cymbels. You will also see lots of children participating with many of the local schools and martial arts organisations well-represented. 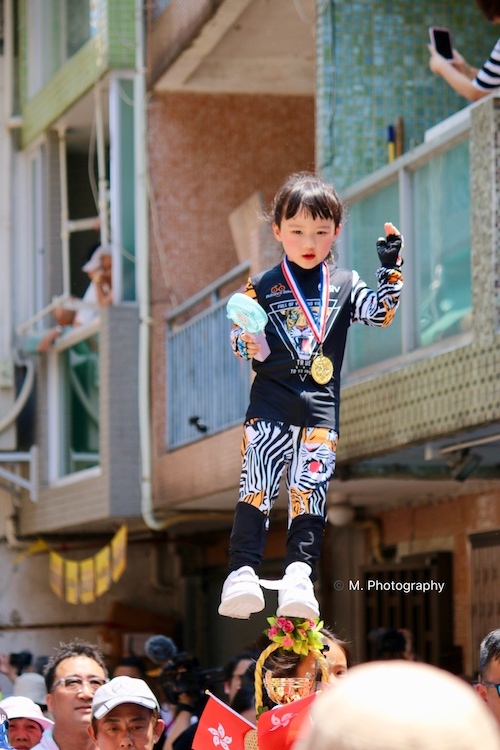 One very unique aspect at the parade is the children held up high on stands, very made up and in colorful costumes that resemble mythological Chinese deities. 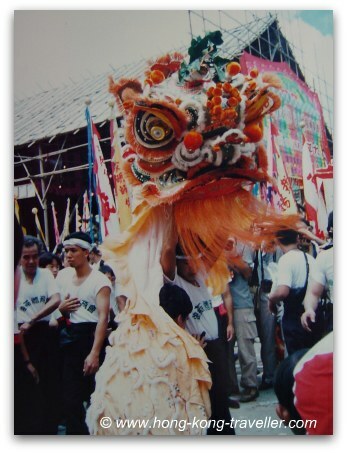 According to the legend, in the past many of the villagers also disguised themselves as the different gods and walked around the lanes to scare off the evil spirits. ...They are propped up and appear to be "floating"
The festival culminates with a very unique and peculiar "Bun Grabbing Contest" at midnight on the last day of the celebrations. 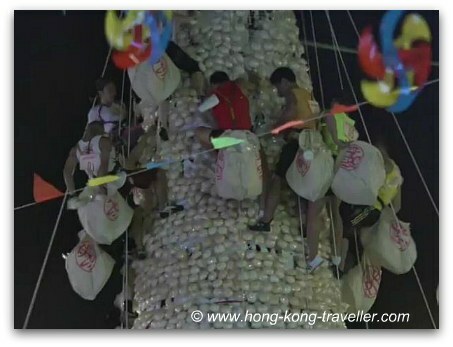 A 60-foot- tower is set up for this purpose and a dozen participants climb up the bun-covered structure as they scramble to grab as many lucky buns as possible in three minutes. This practice was suspended a while back because of security concerns, but was reinstituted back in 2005 after new safety measures were adopted. There are individual competitions as well as team relay competitions. For the individual Bun Scrambling Competition there are twelve finalists that compete in the final "race" and scramble for buns to score points within a time limit. The harder to reach the higher the score. There is also the "Full Pockets of Lucky Buns" awarded to the contestant that gets the most buns within their time allotment. The relay competitions take place right after the individual contest where teams of three bun grabbers climb the tower to grab specific buns, the fastest team wins. 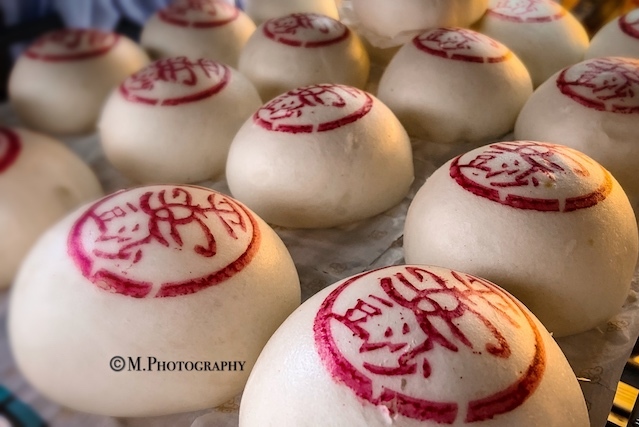 When is the Cheung Chau Bun Festival 2018? 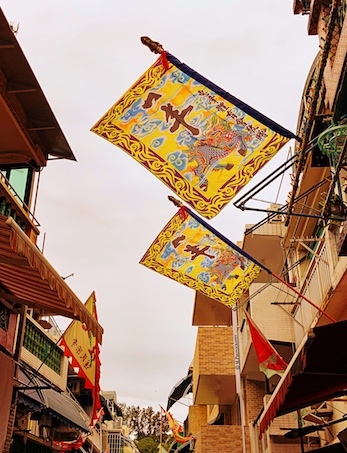 The Cheung Chau Bun Festival is a week-long affair celebrated on and around Buddha's Birthday, on the 8th day of the 4th Moon on the Lunar Calendar, around end of April or May in the Western calendar. 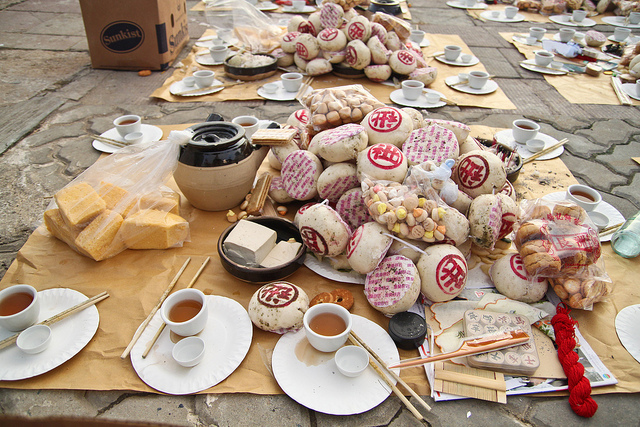 In addition, there is a preliminary Bun Carnival on the weekend preceding the Festival. A "practice" Bun Tower is set up for climbing demonstrations as well as to give you a chance to try it out. 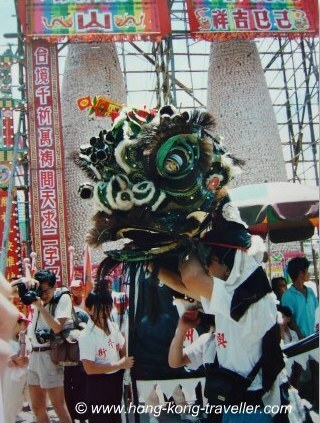 There are the usual festival stalls, music, games and shows, so a good preview for the main event. Where is the Festival and How to Get There? 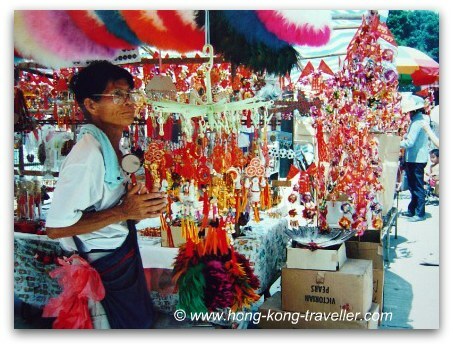 Getting to Cheung Chau Island: 40 or 60 minutes with ferries from Central Pier #5 approx. every 30 minutes. The fast ferry is an enclosed cabin, the standard or slow one is a much more scenic way to get there on the outside decks. During the festival, ferries will be crowded so plan accordingly. From the Ferry Pier in Cheung Chau, the Pak Tai Temple is only a 10 minute walk and you can't get lost, just follow the crowds. 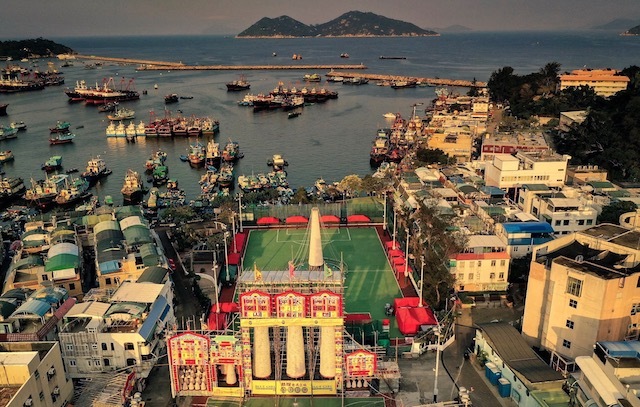 Additional sailings from Cheung Chau to Central and bus routes from Central Pier 5 are normally added to accomodate visitors after the Bun Scrambling contest on the last night of the event. For more info and detail ferry schedule check out the First Ferry site, they will post their holiday schedule and additional sailings as the festival approaches. Here's a Map of the Cheung Chau Ferry Pier, Parade Route and site of the Bun Scrambling Competition. 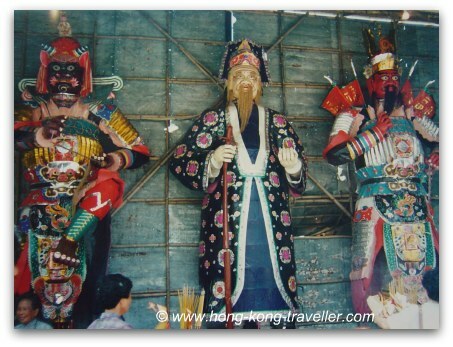 Here's more on Cheung Chau Island, things to do and how to get there. Time To Get Outdoors! 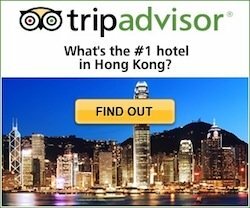 Enjoy some of the best of Cheung Chau!